I love the moment when you break a perfectly poached egg open and the gooey warm yolk spills all over everything. Especially a crunchy piece of toast with lemony avocado spread. Yay! Moment of egg happiness! However, until now I’ve been sadly limited in my poached-egg consumption because the technique of poaching eggs has eluded me. Somehow I always ended up with an overcooked egg bomb with no gooey yolk in sight, or an undercooked icky blob. Yet I wanted to learn, because a poached egg or two is such a great way to add a delicious little package of protein to your otherwise veggie- or grain-based meals, any time of day. Finally, Martha Rose Shulman’s technique in The Simple Art of Vegetarian Cooking: Templates and Lessons for Making Delicious Meatless Meals Every Day showed me the way to a fully cooked white with still slightly gooey yolk. I was so thrilled when it worked! I may even have done a happy egg dance. 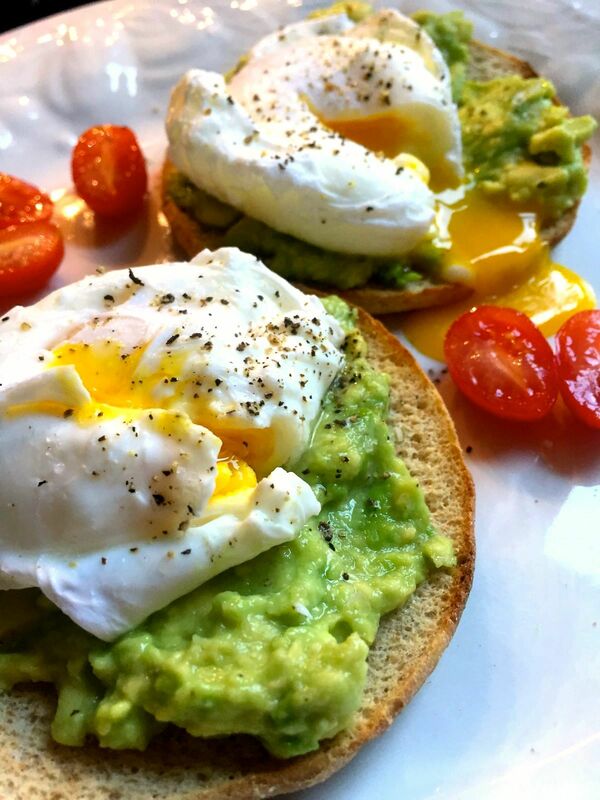 And if I can poach an egg, so can you – better get your own happy egg dance ready! Prepare your poaching water and your eggs: Fill a medium saucepan ⅔ full of water (a couple of inches deep) and put over high heat to bring to a boil. Crack each egg into a small bowl or cup. Once water is boiling, add white vinegar (this helps to keep the egg white from spreading, but I don't add it until the water is already boiling so the kitchen doesn't get too vinegary-smelling). Poach 'em: From the small bowl or cup, tip each egg in as carefully as possible. Turn off the heat and cover with a lid. Set a precise (digital is best) timer for exactly 4 minutes. While the eggs are cooking, get out a plate and layer some paper towels on it to drain your eggs later. Make lemony avocado spread: Meanwhile, peel and pit the avocado, add the juice of ½ lemon, and mash with a fork. (The lemon keeps it bright green and adds flavor!) Add sea salt & pepper to taste. Make avocado toast: Toast your bread. Once toasted, spread ¼ the avocado mixture on each piece. Assemble your dish: Once drained, use the slotted spoon to transfer one egg to each piece of avocado toast. Sprinkle with salt & pepper to taste. Enjoy! Just made this and totally enjoyed it. The eggs came out perfect and the guacamole-yum! Served on ciabatta rolls, toasted. Thanks!